Jarrell Middle School, 101 East Avenue F, Jarrell, TX 76537 (512) 746-4180 Fax: (512) 746-4280 Welcome to the JMS website! 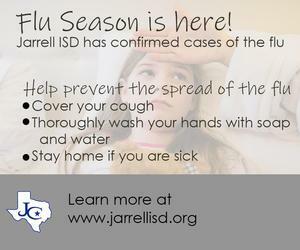 Jarrell ISD has confirmed cases of the flu. 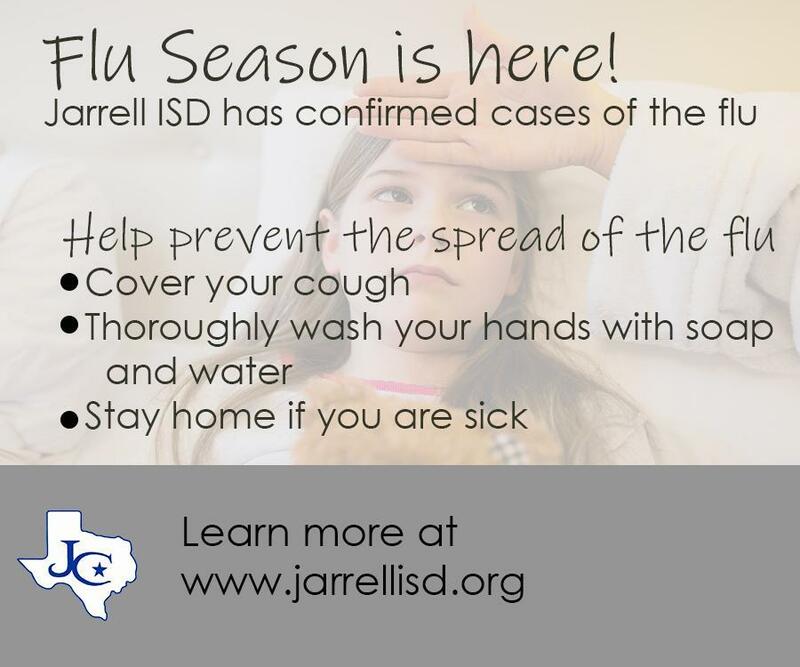 The district is reminding students and families to take steps to help protect themselves from viruses, including colds and the flu. Learn the difference between a cold and the flu. Wash your hands often with soap and water for 20 seconds. If soap and water are not available, use an alcohol-based hand sanitizer. Cover your cough: Cough and sneeze into a tissue then throw it away, or cough and sneeze into your upper shirt sleeve, completely covering your mouth and nose. Wash your hands after coughing, sneezing, or blowing your nose. Disinfect frequently-touched surfaces and objects such as toys and doorknobs. Stay at home if you are sick. Students and staff need to be fever-free without taking medication for 24 hours before returning to school. Students and staff should stay home until they are free of symptoms for at least 24 hours after the last episode of vomiting and/or diarrhea. For more information about the flu, visit the Center for Disease Control.